In years past, foreign trusts were sometimes thought of as a tool for the very wealthy to hide their assets overseas. In reality, a foreign trust can be a legal and savvy way to better protect your assets, diversify your holdings, and provide for future generations. Take a closer look at the specifics of a foreign trust and six specific benefits. A trust is a structure where assets are transferred. The person putting the assets into the trust is known as the grantor, and the person now in charge of managing those assets is known as the trustee. If a third party receives any of the assets or financial benefits in the future, he or she is known as a beneficiary. A foreign trust operates in the exact same way as a domestic trust, but it is located in a foreign country. It means that assets are not just separate from the grantor, but in an offshore location as well. One reason to establish a foreign trust is to separate yourself from some or all or your assets. For a multitude of reasons, many individuals don’t want to be legally tied to their assets. Rather than trying to sell these assets, individuals can simply move them to a foreign trust. Once in the trust, these assets are no longer owned by the grantor or under their direct control. However, you can establish a foreign trust with specific guidelines of intent to ensure that the assets are managed as you see fit in the future. In the United States alone, there are often more than one million cases of formally declared bankruptcies each year. Bankruptcies can be for private citizens or for entire corporations. Many people shudder at the word, but bankruptcy doesn’t always mean failure. Instead, it can be a time to restructure, deal with debts, or explore new opportunities for growth. However, many individuals and businesses want to protect certain assets in the event of a potential bankruptcy. Once assets are in a foreign trust, they are no longer under your name. Therefore, they can also no longer be part of any bankruptcy proceedings. Managing risk should always be a focal point of any financial strategy. While no one likes to think about the possibility of having assets frozen or dealing with a divorce, these events do happen. As long as your assets are in your name and held within domestic investment structures, then they can be seized or penalized. To prevent this from happening, a foreign trust can be beneficial. Since your assets aren’t in your name or under local jurisdiction, they are also out of reach to those who may want to seize them. Moving assets to a foreign trust means that they are now under foreign tax laws. While trusts can and do often need to pay taxes for their area, these can be far less expensive than the taxation rates you’re accustomed to. For that reason, it is important to pick the destination for your foreign trust carefully. It wouldn’t make sense, for example, to establish a foreign trust in a jurisdiction with higher taxation rates than your own home country. Keep in mind that income tax rates aren’t essential to your calculation. Instead, you’ll be looking at capital gains taxes and any taxes on foreign investors. In some countries, such as Belize, these can be negligible or even nonexistent. It is never too early to start thinking about estate planning. For many individuals, the overall goal is to have assets set aside specifically for dependents. Whether you’re providing financial support to your spouse, your children, or even a charitable organization, you’ll want to minimize erosion of those assets. Even after you’re gone, it is important to ensure stability for those that you love. Placing assets in a foreign trust means appointing a trustee to carry out your wishes for the future. This can include, but is not limited to, earmarking assets for loved ones at specific times of their lives. Above all, establishing a foreign trust can give you peace of mind. There are always risks, especially with investments. No financial choice can be 100 percent sound. Nonetheless, choosing certain investment structures can increase your chance of financial stability. When you place assets in a foreign trust, they are no longer under your control. Your trustee is responsible for monitoring and caring for the assets and carrying out your wishes. This can free up a lot of your time and eliminate a lot of worry. You’ll enjoy greater peace of mind about the future and about the financial stability of your loved ones. Even after you’ve decided to establish a foreign trust, knowing how to get started may be a challenge. There is no quick or free way to set up a foreign trust. It is important to take care when establishing a trust, because you need to be confident that the assets within are protected and earmarked appropriately. You’ll also need to appoint a trustee to oversee the trust in the future. You may also want to think about what assets belong in your foreign trust. A trust can contain anything from cash and stocks to real estate. Finally, choose a foreign location that offers low taxation rates and the privacy you need. Clearly, a foreign trust offers a wide range of benefits. The right trust can deliver peace of mind and greater financial stability for yourself as well as your loved ones. 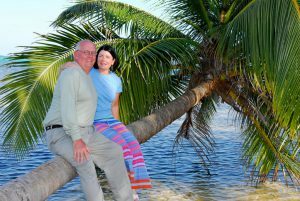 Caye International Bank in Belize has helped many set up their foreign trusts with a bank account. Contact us today to get the help and expertise you need to establish an effective and secure bank account for your trust. This entry was posted on Tuesday, May 8th, 2018 at 8:19 am	and is filed under Offshore Trust. You can follow any responses to this entry through the RSS 2.0 feed. You can leave a response, or trackback from your own site.